You are here: Virgin Islands News Online » News » VINO fires back @ Premier Smith’s childish statement on cartoon! VINO fires back @ Premier Smith’s childish statement on cartoon! ROAD TOWN, Tortola, VI- On the night of March 25, 2015 we were overwhelmed with calls from readers, advertisers and many civil society personnel asking, if we had heard the latest attack on press freedom by Premier of the Virgin Islands Dr The Honourable D. Orlando Smith. We were immediately furnished with an audio clip of the statement made at the closing of the Fifth Sitting of the Fourth Session of the Second House of Assembly of the Virgin Islands. We find Dr Smith’s latest attack on press freedom and particularly on Virgin Islands News Online (VINO), which he claims he was not referring, to be repulsive and even childish, however, not surprising. It has become a norm for his Administration to spend their time in the House of Assembly bashing and trying to intimidate the private sector and singling out businesses they do not like, such as Biwater, VINO and Digicel. Advance Marketing and Professional Services, the parent company of VINO, places on record its disgust over the statements and calls on Premier Smith to retract what was given to him to read and apologise to the staff of the ‘news agency’. It is with a sense of deep disgust and frustration we note that his National Democratic Party (NDP) has spent three long years trying to censor the media as the people have not forgotten the Cyber Bill he brought to the House of Assembly to muzzle the press and put journalists in jail. The Virgin Islands’ Cyber Act has been condemned by the international community. How come Dr Smith was not as equally concerned about the Virgin Islands (VI) reputation when the international community and media organisations in the region, the United States of America and Europe were all condemning the VI as a jurisdiction that is hostile to press freedom? Some may call that school house behaviour selective political hypocrisy, while others may refer to it as just another useless and unfortunate contribution in the House of Assembly by a man who seems to have lost his integrity on this issue. Advance Marketing and Professional Services expresses its gross disappointment that this slander against its ‘news agency’ was allowed without let or hindrance in the Parliament, resulting in a debasing of the House of Assembly (HoA) itself. Premier Smith’s utterances in the Parliament claiming that our cartoon depiction on topical issues will affect our Tourism and Financial Services sectors prove that his priorities have become a complete embarrassment to the HoA and the people of the VI. Our number one media company, Virgin Islands News Online, is firm in its views that in the desperate NDP’s unrelenting attempts to demonise the media, who are not afraid to be objective about the issues in the country, they (NDP) will descend to any depths as evidenced by the numerous attacks on the media and particularly VINO. By Dr Smith calling on the public to “do something about private sector businesses” and making threats, he has perpetrated one of the worst and most disgraceful acts of slander under the guise of Parliamentary privilege and has crossed all boundaries of propriety. We continue to be proud of Virgin Islands News Online’s contributions to the social fabric of our society in five (5) short years. That is why we remain the number one online news site, and advertisers and our partnership with local, regional and international news organisations have been very strong and continue to increase. We stand by our cartoon commentary posted on the news site on March 25, 2015 as it contains the views of many. We, therefore, call on the members of the public, the House of Assembly and the regional and international community to disassociate themselves with Premier Smith’s played out, tired, and boring attacks on press freedom. Callers to our news site and other persons meeting our newsroom team on the streets have already told us that they are disturbed with this latest assault on the character of the local media and that it could have taken place with impunity within the walls of the Parliament. Maybe Dr Smith could better use his time balancing the Government’s cheque book, addressing the high crime rate, sexual harassment on the job particularly, in the public sector and say how his Administration could stop the assault on middle class families and the poor in the Virgin Islands, real issues we are yet to hear addressed after three long years in office!. Ok VINO, I agree with you. The Party in question (including die-hard supporters) has been allowed for too long to intimidate individuals and to ostracize them with impunity. Some persons are apparently singled out, as if there is no place here for them - certain BVIslanders are not supposed to hold jobs in the BVI. Where are they supposed to go to make a living for themselves and their families? This is what happens under the NDP and they need to ask themselves why are they doing this to people. certain BVIslanders are not supposed to hold jobs in the BVI. Where are they supposed to go to make a living for themselves and their families? Ask the General Malon or the man who used to work in immigration and the O'neal woman from VG who the Minister couldnt Jack up.. Personally I think the cartoon is transparent. Freedom of the press, freedom of speech and freedom of thought are things I hold very dear and would willingly go to jail for. Why ANYONE thinks they can censor anyone else is beyond me. I routinely write in the various blogs online and many times, my messages are not posted. I do not and never have slandered anyone. I don't ever use profanity or cuss words of any kind. I simply state my "opinion". However, "some" media outlets take exception to my opinions and I can only assume it is because they don't agree with or like my opinion. Any attempt to silence media houses or the person on the street is positively draconian. THAT is precisely the type of thing that happens in communist countries with state owned (or backed) propaganda houses. Communist theory, dictatorship and censorship go hand in hand. It is an insidious trio used to subjugate, subdue, hush or otherwise put a lid on opposing viewpoints. If my messages contain no slander or cuss words, and simply reflect my opinion, how can anyone object to them ~ "IF" ~ they truly believe in freedom of the press and freedom of speech? I have kept copies of dozens of messages that were not posted by the various media houses. I have shown them to two lawyers and asked if there would be any "legal" reason not to print them and the answer from both was "no". Given that information, one can only assume that "some" media houses don't really believe in freedom of speech at all and that censorship is OK, so long as they are the ones making the censorship decisions. And yes, from time to time I have been censored by all three major online papers that allow bloggers to comment. Vino has done so the least number of times. My husband actually stopped blogging at all because he was constantly censored by the online media. Censorship (if it gets out of hand) will drive bloggers to other sites where their voices will be heard more loudly and be distributed to a much broader audience. I know this to be true, because someone I know pretty well has been toying with the idea of building such a site and having it hosted in the US, where he has family that can monitor it. Freedom of speech cannot and will not be stamped out. Profanity is not necessary, slander is not acceptable, but thoughts and opinions are are simply thoughts and opinions. If public opinion poses a threat to the powers that be, then perhaps they should rethink what they are doing. Do you think the cartoon displayed putting the BVI in the same light as Zimbabwe is freedom of speech? Do I agree with the cartoon or the message it sends? Certainly not. I have a right to my opinion and so does the author of the cartoon. Freedom of expression is the beauty of a true democracy. EVERYONE has a right to be as right or wrong as they wish. Of course it is. What a foolish question. Do you even know what freedom of speech means? It means freedom to express any and all opinions, even ones that you don't agree with. But what did the Premier say? I'm confused. While Alvera placed dr smith in this controversy? What you know about our rep? Just hold it own when it comes to her. Shes holding he own. So you give the news site additional coverage by placing their cartton in the papers and creating the forum for an entire discussion, thereby fanning the fla.mes. Hmmmmh! On the other hand, Freedom of Speech is contained in article 23 of the said Constitution and is read conjointly with article 33 of same. 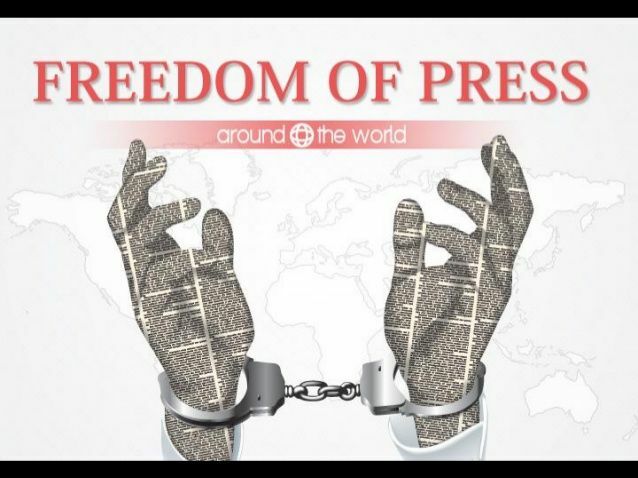 (1) – No person shall be hindered in the enjoyment of his or her freedom of expression. (2) A person’s freedom of expression includes freedom to hold opinions without interference, freedom to receive information and ideas without interference, freedom to disseminate information and ideas without interference and freedom from interference with his or her correspondence or other means of communication. (1) – This section applies if a Court is considering whether to grant relief, if granted, might affect the exercise of the Right to Freedom of expression as defined and protected by Section 23. (3) - The Court shall have particular regard to the importance of the Right to Freedom of expression and where the proceedings relate to material which the Respondent claims, or which appears to the Court, to be journalistic, literary or artistic material (or to conduct connected to such material) to – a) The extent to which – (i) The material has become or is about to become, available to the Public or (ii) it is would be in the interest of the material to be publish and (b) any relevant privacy code. Glad someone finally calling out that NDP for their nonsense. Dr. Smith and his run away train are desperate and whats sad is that his party will not get inn again! i must say dr. smith is Petty, petty!! You know what they say - a drowning man will clutch at a straw. I only pray the voters don't throw this man a life ring. The media has it own biases--That`s life--people will always have favourites--its a matter of choice. pull down who we don`t like for little or no reasons---but find little or no reasons to lift up the people we like--I understand that part of life--I ignore lots of the news--some of it you can tell or driven by dislike or vengeance. When smith secretly getting counseling from Ralph it's OK too. "Maybe Dr Smith could better use his time balancing the Government’s cheque book, addressing the high crime rate, sexual harassment on the job particularly, in the public sector and say how his Administration could stop the assault on middle class families and the poor in the Virgin Islands, real issues we are yet to hear addressed after three long years in office!." Drops mic and walks off stage! why is the premier getting embroiled in media politics?